It wasn’t long before the Scapegoats went national and marched off to the Macy’s Thanksgiving Day Parade as seen in the week of November 22, 1976, starting on page 314. This was followed eventually by Harry marching into real life and lending his name to the Harry L. Dinkle March, a line of Dinkles band shoes, actual band candy, and a series of books collecting his exploits. He even showed up on scoreboards at college football games. 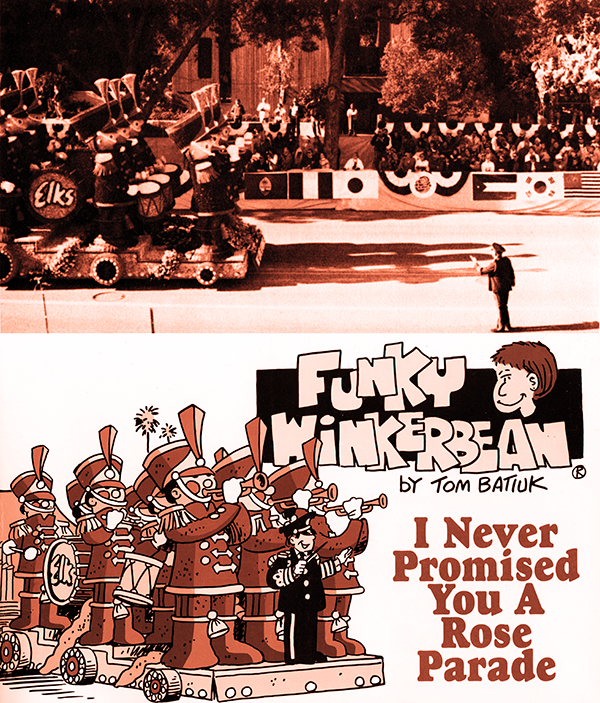 A little further down the line, an actor dressed like Harry would march in the actual Tournament of Roses Parade next to a float that was the same as the one appearing in that New Year’s Day Funky Winkerbean strip.